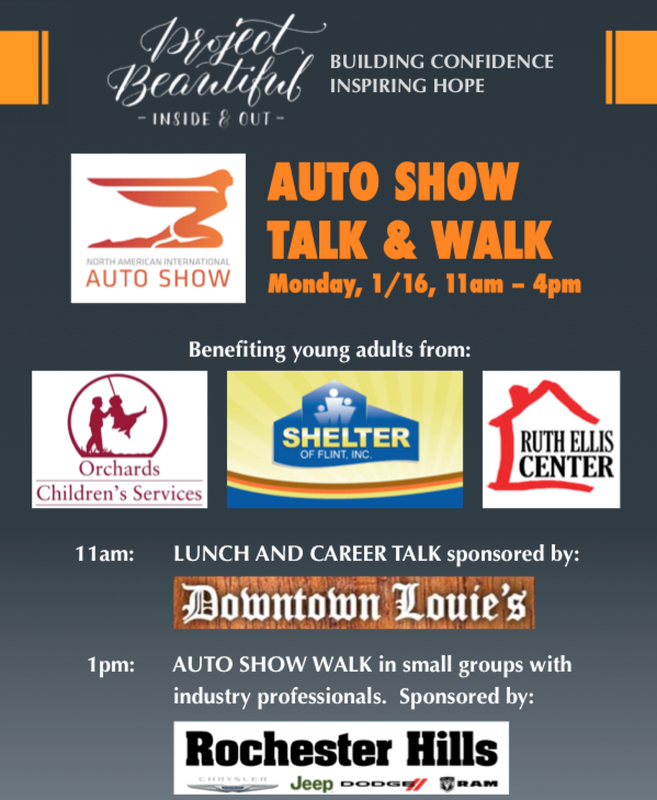 This Martin Luther King Day, Project Beautiful - Inside and Out treated 25 teens from three service organizations - Orchard's Children's Services, Ruth Ellis Center and the Shelter of Flint - to lunch, a career talk and the North American International Auto Show with 10 auto industry professionals in design, engineering, marketing, motorsports, manufacturing and traditional and exotic dealerships. The program was inspired by Michael (pictured in red sneakers with the Alfa Romeo Giulia) after Ralph Gilles, Head of Design for FCA Global, served as his mentor at a Pictures of Hope event at The Shelter of Flint and learned that he loved cars but had never been to the auto show. A huge THANK YOU to program sponsors - Downtown Louie's Lounge and Adrian Gjokaj for hosting and sponsoring lunch, and Rochester Hills Chrysler Jeep Dodge who sponsored auto show tickets. Also, special thanks to the auto industry professionals who spent the day with the kids - Aamir Ahmed - FCA, Syed Ahmed - Platinum Motor Cars, , Meaghan Brown - Doner Advertising, Ralph Gilles - FCA, Ryan Patrick Joyce - FCA, Beth Paretta - Grace Autosport, Lindsey Patrick - FCA, Lincoln Phillip - Rochester Hills Chrysler Dodge Jeep, Bret Scott - FCA, and Caleb VanderWeide - Abednego Environmental Services. Truly a fun and memorable day for all!